Chemistry undergraduates are developing their own research questions and projects in a new class at UNC, thanks to the drive and dedication of organic chemistry professor Nita Eskew. Madeline Cooke (standing) transplants lettuce with other volunteers at the Carolina Campus Community Garden. Cooke began volunteering there each Sunday after taking a chemistry class that required her to do service time in the garden. Madeline Cooke squats in the dirt and leans over the stacked, wooden two-by-fours supporting a raised garden. Scissors at the ready, she trims away weeds and checks the health of rows of red-stemmed succulents. Although many might consider this jade-like plant — called purslane — a weed, it’s actually edible, often found in Asian soups, salads, and stews. And it’s packed with antioxidants. Cooke, a UNC senior majoring in chemistry, spent six months last year helping organic chemistry professor Nita Eskew tend to these weedy plants so she could use them in her “Chemistry of Purslane” class. A Course-Based Undergraduate Research Experience (CURE), the class provides many students with their first active research experience. Organic chemistry can be a little obscure, admits Eskew, so a course that highlights real-world applications draws more student attention. “It’s helpful to have something more concrete you can put your hands on,” says Eskew, adding that the class had so many applicants she couldn’t accept them all. Purslane’s antioxidant content suggests it has medicinal properties — but it’s largely understudied in the United States. Eskew hopes that she and her students can answer some basic questions about it. What are the main differences between the gold and red varieties? Does one have a higher antioxidant concentration than the other? Does the growing environment impact their chemical composition? Throughout the class, which first began in Spring 2017, Eskew teaches standard chemistry techniques like extraction and ultraviolet-visible spectroscopy for identifying antioxidants in plants. Although every student learns how to perform these procedures, Eskew encourages each individual group to cultivate their own sets of questions and experiments. Before she developed the class, Eskew had never heard of purslane — until Claire Lorch pointed it out on a tour of the Carolina Campus Community Garden (CCCG), a program of the North Carolina Botanical Garden located on Wilson Street that donates all its produce to university housekeepers. Lorch, the CCCG program manager, solicits volunteers from across campus and the greater community to work in the garden year-round. Eskew’s partnership with the CCCG for the class means that it’s also one of the Carolina Center for Public Service’s APPLES courses, which connect academic learning with community service. 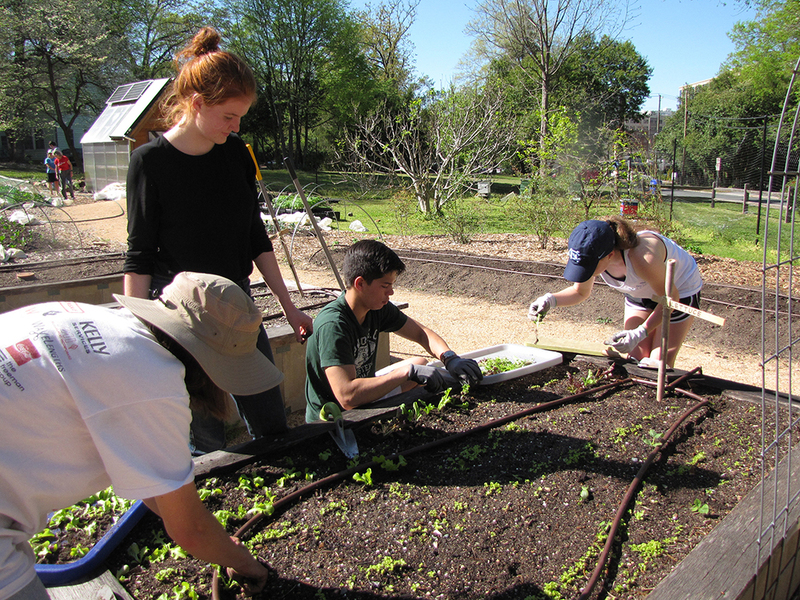 Students enrolled in the course, held once a week, must spend a minimum of 30 hours volunteering in the garden — some of which is used for lab time. During her own undergraduate career at Carolina, Eskew — a first-generation college student — never knew about research opportunities until her adviser suggested she pursue it one summer. She didn’t have any family or friends who were chemists, nor did she understand what chemists did outside the academic environment. This meant graduate school wasn’t originally in the cards for her either, Eskew admits, but that same adviser encouraged her to apply. Nita Eskew is the director of undergraduate laboratories in the Department of Chemistry at UNC-Chapel Hill and a Service-Learning Course Development Grant recipient through the Carolina Center for Public Service. She is also an alumnus, having received both her bachelor’s and PhD degrees in chemistry at Carolina. Madeline Cooke is a senior majoring in chemistry within the UNC College of Arts and Sciences. She is also the teaching assistant for Eskew’s “Chemistry of Purslane” class. Claire Lorch manages the Carolina Campus Community Garden, a program of the North Carolina Botanical Garden. To partner with Lorch or learn more about the garden, email her at clorch@email.unc.edu. The Carolina Campus Community Garden makes use of volunteer support to provide UNC housekeepers with fresh, local, sustainably-grown produce for free. The garden strives to connect students, community members, UNC employees, and gardeners.